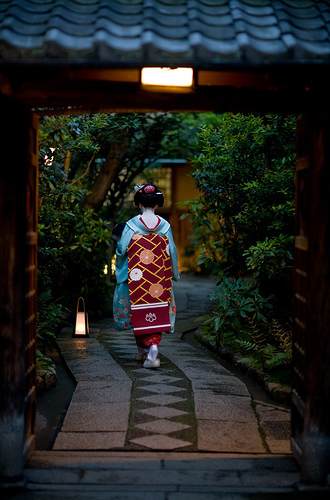 On the streets of the historical towns in Kyoto, beautifully dressed geisha are often seen. Geisha are professional hostesses who entertain customers with conversation and performing arts. 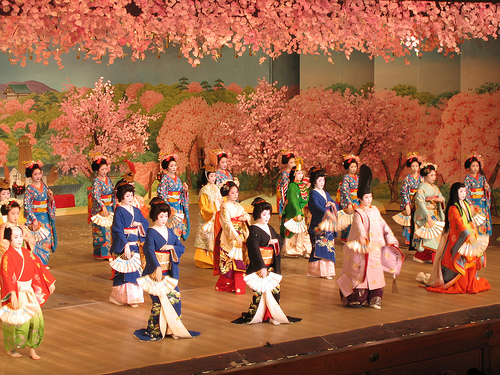 As you know, they wear kimono, special hair styles and red lipsticks on white painted face. In Kyoto, geisha are called geiko, and the young geiko who were trained by veteran geiko at geiko-house (ochaya) after six months to two years of live-in training are called maiko. They wear long-sleeved kimono (furisode), long ribbon-like sash (darari no obi) and fancy ornamental hairpin (kanzashi) while mature geiko dress simpler as sophisticated ladies. Traditionally, the ornamental hairpins are changed by the month. For example, cherry blossom ornament is used in April and Japanese wisteria is used in May. This picture shows a maiko, who is wearing long-sleeved kimono and long obi (kimono sash) hanging on her back. This maiko wears long obi, but trainee maiko wear shorter obi so they look younger. Another thing about fresh maiko is that they are allowed to wear lipstick on their bottom lips only. In Kyoto, there are places where women can dress like maiko; therefore, “fake” maiko are on the streets and sometimes taken pictures by tourists. Sometimes tourists think they are real maiko. Real maiko are so distinguish. Maiko do Japanese hairstyle with own hair while most fake maiko wear wigs. When you look at their kimono, real maiko wear high quality kimono with genuine crest on their obi. 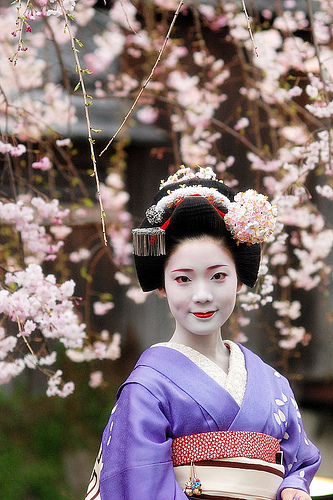 There are actually realistic maiko costumes and makeover that make the women look real maiko at a glance. The most certain way to distinguish them is to see their actions. Maiko are well mannered and they are trained to do every action beautifully; for example, they walk with their toes turned inward.